Fiendish and dependent on your own crafting legwork, this is time you’ll never regret doing. There’s something beautiful about the perfectly planned prison escape, isn’t there? Ignoring the fact that if you’re in the clink it’s (hopefully) with good reason, there’s something so gloriously... Shawshank about the whole affair. All that swimming through sewage, just for the final moment when you can raise your face triumphantly to the skies and wish that Morgan Freeman narrated everything. We’re delighted to say that Mouldy Toof Studios has managed to capture the precise joy of the ultimate breakout in pixel perfect form, Rita Hayworth posters and all. 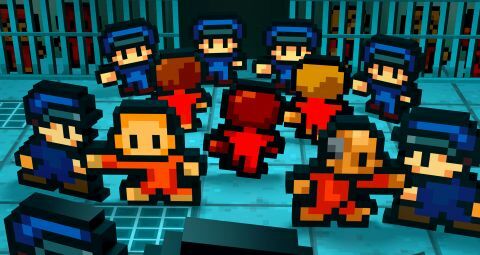 Available in Early Access on Steam since August, The Escapists, now in its final form on PC and Xbox One, hands over six different prisons for your freedom-desiring sensibilities to crack their way out of. Whether it’s the relaxed Center Perks or frankly terrifying HMP Irongate, it’s your job to plan your escape around a strict regime. Not only does giving each day a rigid schedule instantly deliver a ‘new kid in school’ vibe as you explore and work out stylishly pixelated allegiances over breakfast, it also handily institutionalises you. As you obey the clock, toe the line in front of the guards and befriend other inmates you also have to attend three meals a day, perform well in your menial job, exercise for an hour and, oh yes, try to get out. The tools for your exit are all within your reach but it’s knowing what to do with them that counts. Seemingly endless items can be stolen from the cells of other inmates to curry favour or be made into weapons and tools, and contraband is everywhere. Crafting is key and thankfully – for those so inclined – there’s already a comprehensive wiki available detailing the ways to create the most useful tools. Our take? While recipes can be bought from other cons with hard-earned cash, the likelihood is that you’ll never get out of Center Perks without a good read online. Plus, the need for a certain level of intellect when building tools adds a satisfying slog to proceedings as you spend a day or two on best behaviour in the library to improve your IQ. The need for a tablet beside you is a small complaint as the glorious possibilities of each unique prison become apparent. Perhaps you’ll instantly steal plastic spoons from the lunch room, cover the bars with bed sheets and start digging? Or maybe you’ll get your mitts on a screwdriver and disappear into a vent shaft, a body made of pillows and blankets fooling the guards into thinking you’re still in bed. It’s not easy. But, if popular culture teaches us anything, neither is prison. Punishment is swift and you can find yourself set back four days as you’re sent to solitary. Prison relations are key, and it’s the precise juggling of guards, fellow cons and the daily grind that The Escapists gets so right. Snappy writing and endless possibilities mean you really don’t want that Get Out Of Jail Free card.